Where Does Modern Go From Here? Saying goodbye to Eye of Ugin was not a surprise. We knew Eldrazi had become too strong, too consistent and too prevalent to continue existing in Modern. We knew something was going to be banned — I advocated for Eye of Ugin — and in the end it’s no surprise to see the deck knocked down a pretty large peg. But how about the rest of that announcement? Did any of us really expect this? 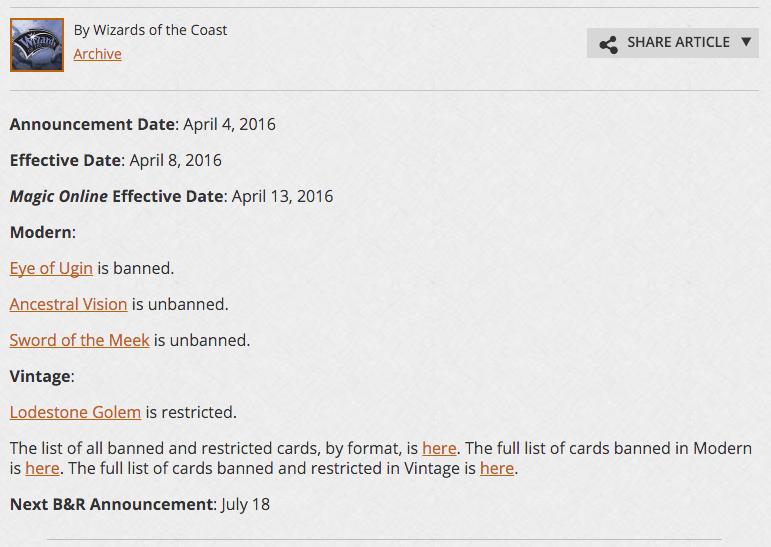 Today I want to look at the other half of the announcement – the part where Ancestral Vision and Sword of the Meek were unbanned. People certainly expect these to have a huge impact on Modern; after all both were banned for a reason after they had dominating runs in Extended over the years. And given the hype and rush on these cards, is it any surprise that the prices went crazy as well? Sword of the Meek is a mind-blowing $20 Uncommon as of today, while Ancestral Vision is $50 despite multiple printings. First off, I don’t believe either will blow up Modern and take over, and as a result I don’t believe the current prices are here to stay. Players and dealers will dig these up over the next few weeks and months, and the price will slowly come down as players realize that they won’t be taking over the entire format anytime soon. If you don’t need these to play a tournament right now, your wallet will thank you if you wait a few weeks or months before deciding to buy in. But will you even need to? Will these two cards shake up Modern that much, or will they become simply another pair of cards that are sometimes good and other times hated out? Let’s start with this one, because it’s a little more straightforward. Sword of the Meek forms a deadly combo with Thopter Foundry, with the Foundry sacrificing the Sword to create a 1/1, which conveniently brings the Sword back, netting its user 1 life and a Thopter. 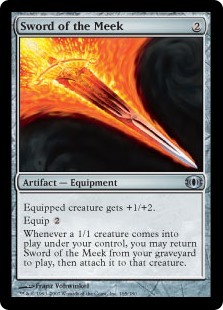 They then have the Sword ready to sacrifice again, and for every mana the user spends they get a Thopter and a point of life. It’s a pretty brutal lockdown method, and closes out a game quickly while also taking its user out of burn range. Back when Extended held the place of Modern, Thopter Foundry was a pretty dominant strategy, slotting into several decks but most notably combining with the combo of Vampire Hexmage and Dark Depths to form a brutal one-two punch. With Muddle the Mixture available to transmute for missing pieces of either combo, the deck was an absolute powerhouse and was the bane of the format for long enough to land Sword of the Meek on the banlist when Modern was announced. So now Wizards has unleashed the Thopter menace back on us. What to do? Well, the first piece of advice I have is to not panic that this is going to ruin Modern. There are a lot of interesting ways to take the deck, from a lockdown Ensaring Bridge deck to a focused Tezzerator build with either Tezzeret, Agent of Bolas or Tezzeret the Seeker providing the namesake and the Thopter engine closing out games. Even in a more traditional control deck the combo gives it an extremely powerful endgame that if left alone will end the game rather quickly. But it’s the “left alone” part of that statement that merits more consideration. When Thopter/Sword was good, abrupt decay, Kolaghan’s command, scavenging ooze, and RiP didn’t exist. Look at Legacy. Sword unban is safe. Add to that list Stony Silence. Yes, Thopter combo is still very powerful, but the important thing to remember is that this is not the Extended of 2010 when Gerry Thompson unleashed this monster on the world. Take a look at that decklist. The powerful Thopter combo is there, but a lot of other cards are missing. Starting at the top, Dark Depths is still banned, taking out half the deck’s plan right away. Just as devastating is the lack of Chrome Mox, which allowed the deck to play the first combo piece on Turn 1 and lay the second on the second turn and immediately make a Thopter, closing out the game soon after. Simply put, that won’t be able to happen in Modern, and not just because Chrome Mox rightfully lives on the banlist. Sure, Mox Opal will sometimes do a reasonable impersonation, but there are lots of ways for current Modern decks to deal with the combo. Crucially, these are maindeckable ways, with Abrupt Decay and Kolaghan’s Command living at the top of that list. Both of those cards are played in multiple Tier 1 decks, and their presence will help keep Thopters from dominating Game 1s. Then in comes the sideboard hate, with Stony Silence, Ancient Grudge, Shatterstorm, graveyard hate, Creeping Corrosion and even Fracturing Gust able to efficiently answer most of what a Thopter player is doing. That’s not to say that Thopter-Sword won’t be good – with the ability to wait to “go off” until the end of an opponent’s turn, the combo will be very good in a lot of situations. That said, it does seem like all these factors push it into the role of finisher in a control deck, rather than the centerpiece of a degenerate combo deck. 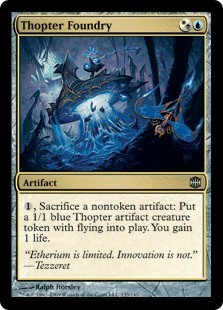 All in all, I think Thopter-Sword will be a strong addition to control decks and improve the diversity of the format. The other half of our unbannings, Ancestral Vision is a contentious one. After all, the games where it is suspended Turn 1 and then the player proceeds to counter or kill your first three plays before reloading with Vision feel pretty bad. But those times are somewhat balanced out by the fact that it makes for a poor topdeck and isn’t necessarily all that much better than other “Turn 4-5” spells like Collected Company. Let’s look at the history of the card. Since its printing in Time Spiral, Vision has been a solid card advantage choice for Control players. After all, drawing three cards is something blue mages have done since Ancestral Recall in Alpha, and as the banning of Treasure Cruise last year shows, there are few lengths to which players won’t go to if it means drawing three cards. 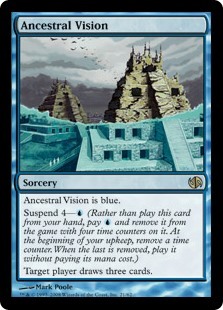 In the past, Ancestral Vision was a devastating Turn 1 play in decks like Faeries that could follow up with a Bitterblossom and then removal spells and Mistbind Clique or Cryptic Command. Interestingly, that’s a line that is now going to be available in Modern. But Faeries has been far from dominant (or even “good”), and cards like Cavern of Souls and strategies that naturally prey on Faeries have kept it from being the terror it was during its heyday. Which brings us back to Ancestral Vision, which had quite the heyday. Fewer things are more soul-crushing than watching a Bloodbraid Elf cascade into Ancestral Vision, and in the days preceding Modern there were plenty of Jund decks splashing blue just to have access to this backbreaking play. It shouldn’t be any surprise that Bloodbraid Elf is still on the current Modern banlist, and it’s no surprise that blue mages who remember those days are excited to have Vision back. But is it really going to be that bad? As I mentioned earlier, Cavern of Souls existing automatically means some decks will have natural advantages against Ancestral Vision decks, and you can add to that the fact that anyone who suspends this card on the first turn isn’t using a Lightning Bolt to take down the Goblin Guide attacking their face. And let’s face it, when you can’t suspend Ancestral Vision on the first turn because you’re facing down a Wild Nacatl or Goblin Guide or Glistener Elf, the card becomes much worse. That only covers the early game. There’s a huge difference between drawing, say, a Treasure Cruise on Turn 5 and drawing Ancestral Vision on that same turn. There seem to be plenty of natural checks to this card in the current Modern metagame, and considering the underdog role Control decks are starting from in the first place, this doesn’t seem likely to push them fully over the top. While I’ve spent the preceding paragraphs detailing the ways in which Thopter-Sword and Ancestral Vision are manageable, that doesn’t mean these cards aren’t very good, because they are. I expect both to find homes in Modern, and in the case of Thopter-Sword may actually encourage entirely new archetypes. 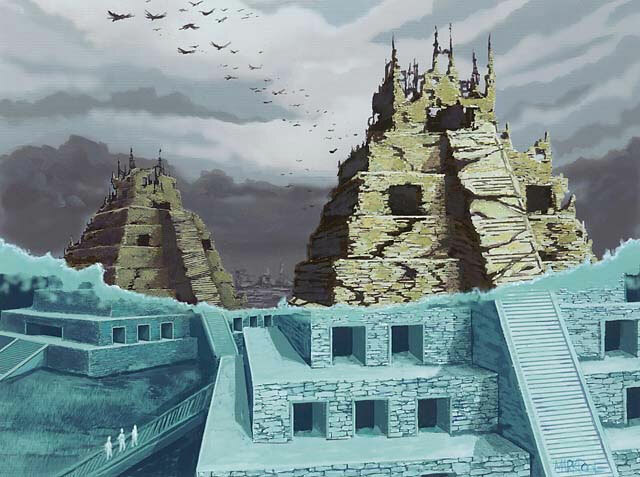 And — coupled with the ban on Eye of Ugin — both should help control decks make a comeback into Modern. Both of these offer powerful mid and late-game options for those decks, and will help them compete with some of the card advantage engines we’ve recently seen come to define decks in the other colors. There is a chance that things will swing to the control side of the spectrum (chaining Cryptic Command into a resolved Ancestral Vision is pretty darn good), considering the underdog position traditional control strategies are starting from, I don’t think there’s any doubt they could use a little love right now. I’m excited for the possibilities this opens up for Modern, and I’m excited to see where things go from here. Just know that I’ll still be playing Merfolk.